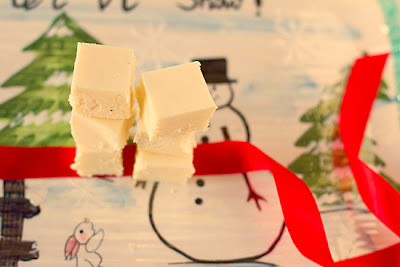 Juneberry Lane: FROSTED: Sing Some Festive Beats...With Christmas Carol Inspired Treats! 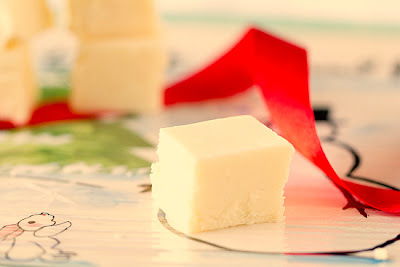 FROSTED: Sing Some Festive Beats...With Christmas Carol Inspired Treats! As soon as the calendar page flips to December, my IPhone quickly fills with playlists of all my favorite Christmas Carols. I am often heard belting out Santa Baby in the shower, humming Jingle Bells while doing household chores, or rocking out to All I Want For Christmas Is You while driving to work. So, the other day while listening to one of my many holiday ballads, the song We Wish You A Merry Christmas came on and I noticed that the lyrics mentioned Figgy Pudding. I have heard this song many times before but I never really questioned what this type of festive pudding could be. Well, I did some research and discovered that Figgy Pudding is a very thick and heavy cake-like dessert. Sounds like something I would definitely try! This made me wonder how many other interesting foods, desserts, and drinks are mentioned in Christmas carols that we often don't know exactly what they are or overlook during the holidays. So this week, I am sharing with you some Christmas tune inspired treats that will have your guests crooning your praises. 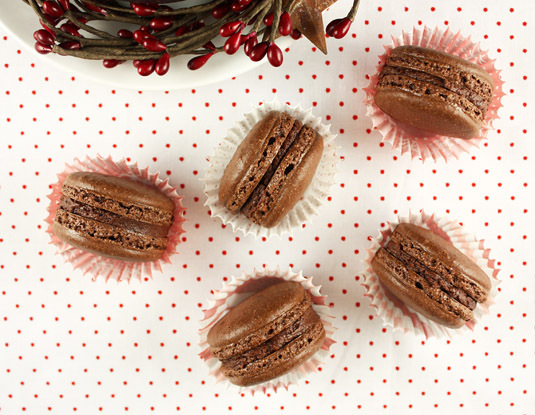 Now warm up your oven and record some of these holiday song inspired confections into your cookbook . . .
1. Sift together flour, salt, nutmeg and cinnamon in a bowl and set it aside. Dice figs into small chunks and put them in a saucepan with the milk. Heat on low, stirring occasionally for about 15 minutes. 2. Put 1 1/2 sicks of softened butter in the bowl of the electric mixer fitted with the paddle attachment. Mix on med-high until the butter is fluffy, about two minutes. 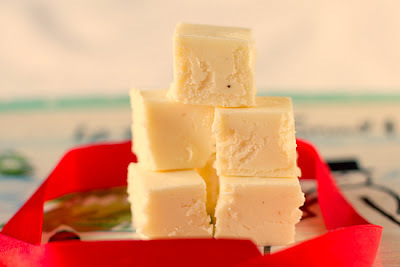 Sift 3/4 cup of confectioners sugar into the fluffy butter and mix until smooth. Add in one egg and reduce speed to low. Add in flour mixture and mix until just combined. 3. Strain the figs from the milk. Add them, along with the orange zest, to the dough. Fold in until the ingredients are evenly distributed. Wrap the dough in plastic and refrigerate for 2 hours. 4. After the dough has cooled, preheat the oven to 350 degrees. On a well-floured surface, roll out the dough until it is 1/8 inch thick. 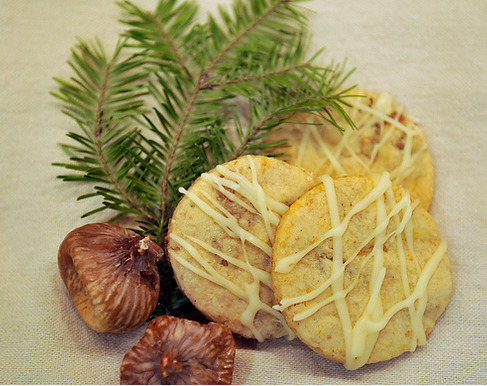 Using a 2 inch round cookie cutter, cut out the cookies and place them on a parchment lined cookie sheet, spaced one inch apart. Bake for 10-12 minutes or until the edges are golden brown. 5. 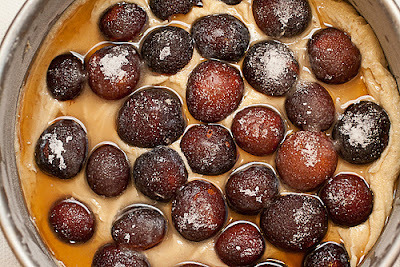 While the cookies are baking, combine all the ingredients for the Brandy-Sugar Glaze in a saucepan on med-low heat, and stir often, until the sauce comes together. 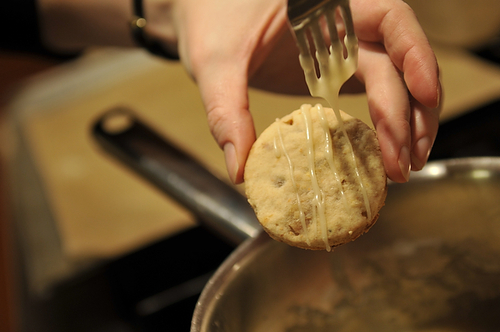 After the cookies have cooled, use a fork to drizzle the warm glaze on them. 1. Place popcorn in a very large mixing bowl. Melt almond bark according to package instructions. When completely melted, add extract or peppermint oil. If using extract, it’s normal for the almond bark to seize (get lumpy) which is okay, just stir very quickly, the more you wait the more it will seize. 2. 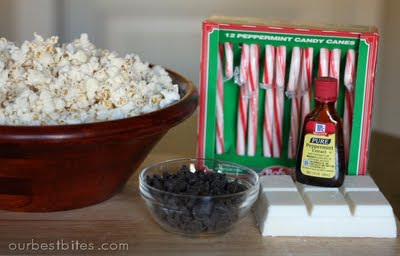 Pour melted almond bark mixture over popcorn and pour crushed candy canes on top. Stir to evenly coat. Pour popcorn out onto waxed paper, parchment, or foil and spread out. 3. Place chocolate chips in a microwave safe bowl and heat in 30 second intervals, stirring in between, until melted and smooth. 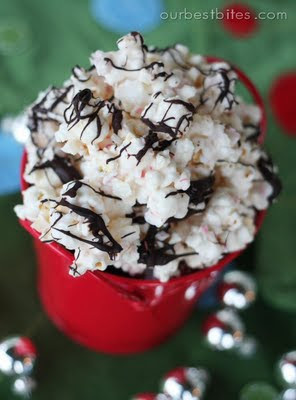 Drizzle over popcorn mixture. Let mixture dry completely until chocolate and almond bark are hardened. You may place in the fridge to speed process along. 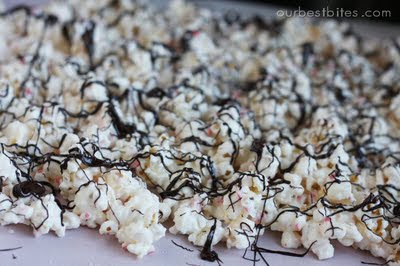 When chocolate is hardened, use your hands to break up popcorn into chunks. 1. In a small pot, combine apple cider, pineapple and orange juice, honey, dark brown sugar, and whole spice. Bring to a simmer to dissolve sugar. Remove from heat and let the spices steep for 20 minutes. Strain and chill. 2. 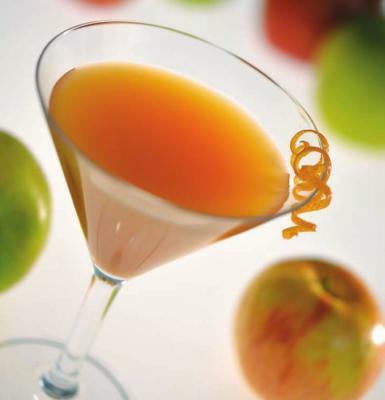 Pour chilled wassail into a mixing glass with gin, vodka, and a few ice cubes. Stir or shake and strain into a glass. Garnish with orange zest curls. 1. In a medium bowl, beat cream the butter using an electric mixer. Add the chestnut spread, cocoa powder and rum, and beat together until creamy and homogeneous. Set aside. 2. 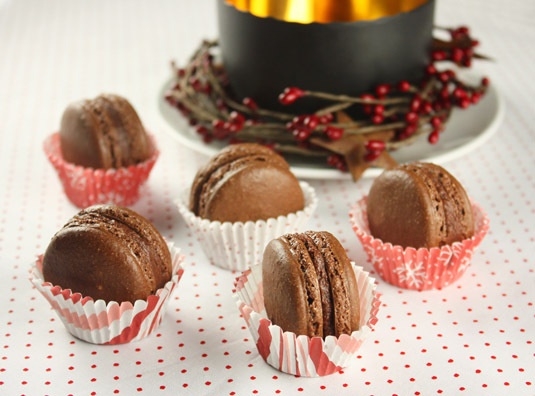 Take the egg whites out of the refrigerator about an hour before making the macarons to bring them back to room temperature. Line two doubled baking sheets with parchment paper and set aside. 3. 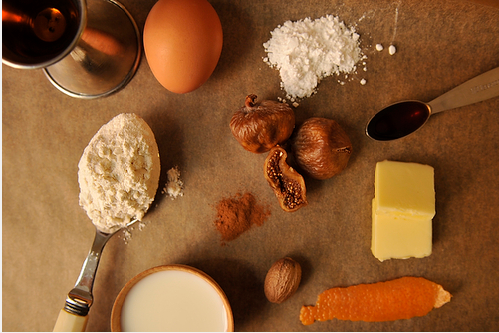 Place the almond meal, powdered sugar and cocoa powder in the bowl of a food processor. Finely grind everything together for a minute or two. Stop the processor, scrape the sides and bottom of the bowl, and process again for a minute. After processing the sugar-almond-cocoa mixture, carefully sieve it, discarding any bigger bits that remain in the sieve. Reserve. 4. Put the egg whites in a large stainless steel bowl. 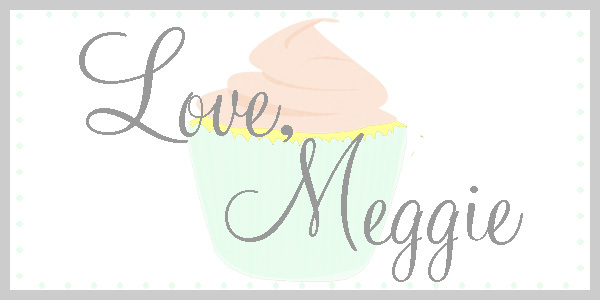 Beat at medium/high speed with a handheld or stand mixer. Once they start to get bubbly and white and the whisk is lightly leaving marks, slowly add the granulated sugar. Keep on beating until stiff peaks form. 5. Add the coffee extract to the egg whites along with a third of the almond-sugar-cocoa mixture. Fold to incorporate by sliding a rubber spatula down to the bottom of the bowl and gently bringing it back to the top. Keep on adding the almond-sugar-cocoa mixture a third at a time until everything is incorporated, always folding gently and never beating. 6. Pour the batter in a pastry bag fitted with a round 1/2-inch tip, then pipe equal rounds of batter on the parchment-lined baking sheets. Let rest for 20-30 minutes before baking. 7. Preheat oven to 310°F (155ºC). When the shells have rested enough, bake for about 15 minutes, or until the shells are firm on their feet when lightly tapped. 8. Let cool the shells completely, then remove from parchment paper. Fill with chocolate-chestnut buttercream, then refrigerate for 24 hours before eating. Enjoy within the next 5 days for the best texture and flavor. 1. To toast the walnuts, toss in a dry skillet over medium for a few minutes until toasted. (Watch carefully, they can burn easily). Immediately remove to a plate and grind in the food processor when cool. 2. Preheat the oven to 350 degrees F. Butter a 9-inch springform pan with 1 Tablespoon of the butter and dust with 1 Tablespoon of the flour. 3. Toss the plums with 2 Tablespoons of sugar and the brandy, set aside. 4. Stir together the remaining cup of flour, baking powder, and salt together in a small bowl. 5. In a large bowl, cream the remaining 8 Tablespoons of butter into the sugar, lemon zest, and vanilla until light and fluffy. Sift in the flour mixture. 6. In a separate bowl, beat the eggs just until they start to foam. (Do not overbeat). Fold the eggs and the ground walnuts into the flour-butter mixture and mix well. 7. Scrape the batter into the prepared pan. 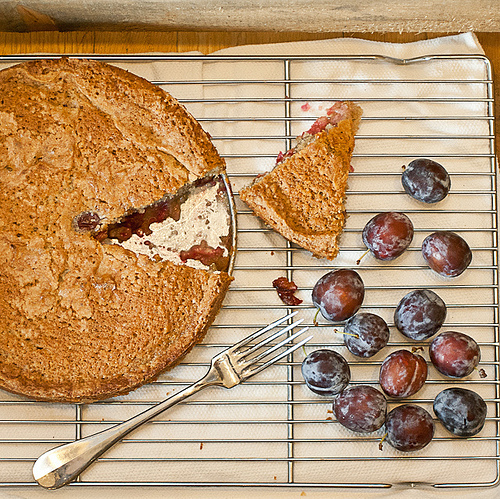 Arrange the plum halves, cut side down, in concentric circles over the batter. (The batter will rise up around the plums as is bakes.) Pour any remaining brandy syrup on top. Sprinkle with the remaining 2 Tablespoons of sugar. Slide onto a cookie sheet to catch any spills. 8. 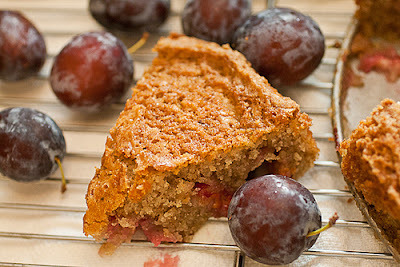 Bake one hour, or until the plum cake is golden brown and a cake tester comes out clean. (Be careful not to test through a plum!). Cool 10 minutes before removing the sides of the springform pan and serving. Who knew that food set to music could be so scrumptious? What a delicious harmony these goodies could make at the next Christmas concert at your church, your children's upcoming holiday program at school, or a vintage holiday gathering at your home. So turn up the volume on your radio, synchronize it with the sound of your blender, and make Bing Crosby eat his words with these yummy Christmas carol inspired treats. Have a wonderful weekend!